Formulated with 9 Complex (Peppermint Extract, Apply Mint Extract, Sage Extract, Rosemary Extract, Lavender Extract, Cabbage Rose Petal Extract, Lemon Balm Leaf Extract, Chamomile Extract, Bergamot Extract) and Horse Oil from German, which helps to maintain 72 hours long lasting moisturizing effect, to improve skin resilience excellently and strengthen the skin tension with filling the moisture between the skin cells. Also containing cermamide ingredient, most similar to the human skin layer, helps to moisturize and refresh your skin by infiltrating smoothly into the skin and forming the hard moisture layer without any residue left unlike animal fat or plant oil. Main ingredient: Niacinamide, adenosine. To repair damaged skin. Improves texture by enhances firmness of the skin. Reduce appearance of enlarged pores. Brightens the skin and construe appearance of luminous skin. It has a buttery smooth and thick texture similar to most night cream. It has a zesty lemon scent which lingers for awhile. It doesn't have icky and oily feeling. Can be applied during the day underneath makeups. The packaging for this cream is over the top. Even high-end skincare products can top it. It has a sturdy box that resembles Hermes packaging (talking about horse!). The box has a plastic stand. The bottle itself has gold embossed cap. It has a plastic spatula which comes really handy to scoop when you reach half of a jar. Due to its popular demand, there are a lot of counterfeit products in the market. Claire (the manufacturer) keep on revising its packaging to differentiate themselves from the fake products in the market. I will post up a guide on how to differentiate them. At the mean time, if you read Chinese/Korean, you can check out their guide from their website. Although it has thick texture, it doesn't leave any sticky or annoyance feeling. Obvious improvements can be seen on my skin within a week. I only apply it during night. On the areas of improvements are texture - pores are minimized, fine lines - reduced drastically, brightening - skin looks more luminious. It is one of those products which can't see much difference, but once you stop using it you will find your skin deteriorating. In production of this product, the manufacturer ensures that no horse are being harmed. This is because the horses are farmed and supplied by Germany, France, Kazhastan, Belgium, Italy and Quebec for its meat. Since I'm working in manufacturer environment, I understand the supply chain effects. It is indeed a good product to recommend but I limit myself to recommend this product to those who really in need of speedy repair to their skin. Currently we are still able to control the supply. If there is a drastic increase of demand for this product, the supply of the horse oil need to be increased. At that point of time, no one is able to guarantee that no horses will be harm. The sustainability of the horse oil supplies worry me. For the love of the horses, do stick to plant-based products, unless you really need this product. Water, Caprylic/Capric Triglyceride, Butylene Glycol, Glycerin, Horse Fat, Butyrospermum Parkii (Shea) Butter, Niacinamide, Cetearyl Olivate, Dimethicone, Cyclopentasiloxane, Beeswax, Sobitan Olivate, Cetyl Alcohol, Sodium Polyacryloyldimethyl Taurate, Snail Secretion Filtrate, Mentha Piperita (Peppermint) Leaf Extract, Mentha Rotundifolia Leaf Extract, Salvia Officinalis (Sage) Leaf Extract, Rosmarinus Officinalis (Rosemary) Leaf Extract, Lavandula Angustifolia (Lavender) Flower Extract, Rosa Centifolia Flower Extract, Melissa Officinalis Leaf Extract, Chamomilla Recutita (Matricaria) Leaf Extract, Monarda Didyma Leaf Extract, Cyclohexasiloxane, Bixa Orellana Seed Oil, Betaine, Carbomer, Polysorbate 20, Palmitoyl Oligopeptide, Palmitoyl Tetrapeptide-7, Phenoxythanol, Stearyl Alcohol, Titanium Dioxide, Aluminum Hydroxide, Hydrated Silica, Disodium Cetearyl Sulfosuccinate, Dimethicone/Vinyl Dimethicone Crosspolymer, Fragrance, Tocopheryl Acetate, Simmondsia Chinensis (Jojoba) Seed Oil, Centella Asiatica Extract, Camellia Senensis Leaf Extract, Ligularia Fishceria Leaf Extract, Sodium Ascorbyl Phosphate, Glycine Soja (Soybean) Oil, Human Oligopeptide-1, Lecithin, Astaxanthin, Myristyl Alcohol, Xanthan Gum, Adenosine, Disodium EDTA, Octyldodecanol, Hydrogenated Lecithin, 1, 2-Hexanediol, Caprylyl Glycol, Ceramide 3. If you would like to purchase this from Althea, do use my referral link <<here>>. 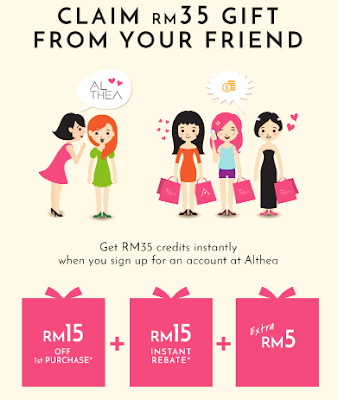 You will receive a RM35 credits in your account immediately once you sign up. I won't be getting any commission from the referral, instead I will get points which I can exchange for products that I want.